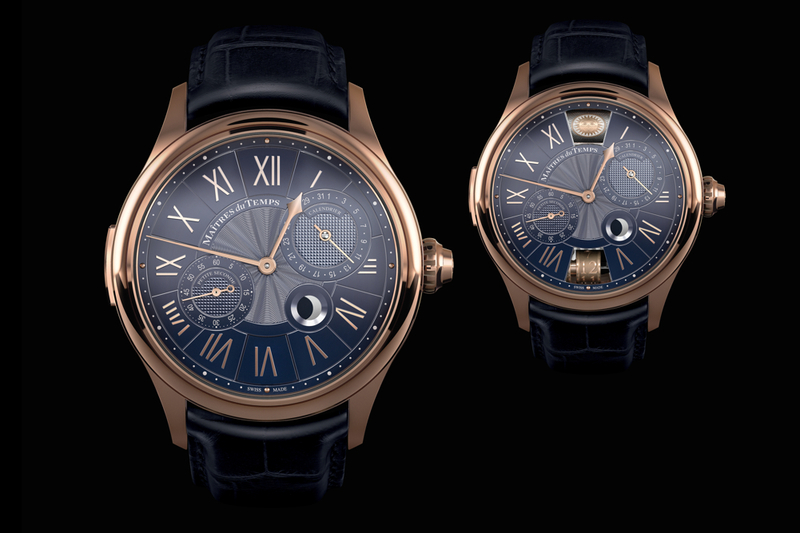 At Baselworld 2012, Maîtres du Temps introduced their first round timepiece – the Chapter Three Reveal. As with all Maîtres du Temps (Master of Time) timepieces, this creation is the result of the collaboration between some of the industry’s best master watchmakers – in this case, Kari Voutilainen and Andreas Strehler. “Opening the invisible panels reveals the day/night indicator at 12 o’clock and the second time zone indicator at 6 o’clock. The day/night roller rotates in 24 hours and features engraved, polished, printed, and hand-painted icons: the sun to symbolize day and the night sky to represent night. This indication is of particular benefit when using the second time zone, which is why it is revealed at the same time, as it enables the user to keep track of the hour at home and to know at a glance if it is day or night there. The second time zone is adjusted by means of the ergonomic quick-set pusher at 9 o’clock, which esthetically follows the form of the case. Each push advances the second time zone roller by one hour. These time zone and day/night rollers are permanently synchronized with each other and can adjust both forwards and backwards in time through the crown. To maximize legibility, the second time zone at the bottom of the dial is displayed on two separate rollers: hours 1-6 on one and 7-12 on the other. When transitioning (forwards or backwards) between 6 and 7 or 12 and 1, the superseded roller slides horizontally out of the way and the new roller moves into place. This innovative mechanism has been awarded a patent. Using two rollers instead of one means that only six numbers have to be displayed around the circumference of each roller, enabling them to be twice as large, so twice as easy to read.